There are so many variations on the “Monster In A Box” prop that it’s nearly impossible to pin down an exact definition other than the one suggested by the name. Some say that the definition should apply to any kind of prop where a monster suddenly bursts out of a box or container of some kind (like the above-pictured example). However, many in the haunting community would argue the term traditionally refers to a prop where a sealed box covered in warning signs suddenly starts shaking. But even props that fall under that definition have numerous variations available. Some versions might use the movement, lights, fog and/or sound effects to imply the presence of a monster inside, while others might opt to give visitors a quick (partial) peek of the creature inside. Sometimes the lid might open completely and nothing will emerge from the box! Some versions operate continuously, while others are activated through the use of mat switches, event timers or motion sensors. Using one version one year and the other during the following year can make for a good effect. 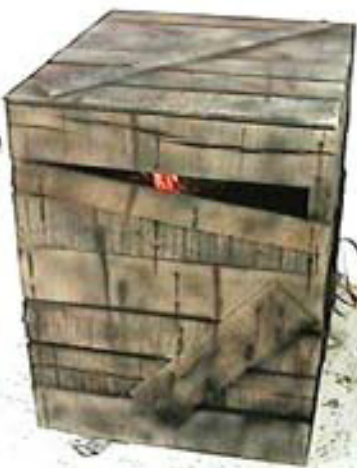 Guests expecting the box to shake around like it did last year will be extra surprised when a monster pops out. Alternately, having a monster pop out one year and using a chained up and shaking prop using the same sort of box next year makes for an amusing gag. There’s even variants that act as a hybrid of the two main types of “Monster In A Box” props. My favorite example of this has the monster burst out of the side after seemingly failing to escape through the top. It’s a great bit of misdirection that really enhances the scare factor of the prop. In addition to the usual wooden box or crate, the effect can also be used with chests, trunks, coffins and even a giant version of a “Jack-in-the-box.” Although optional, having a flashing light emit from the box is another great way to enhance the effect. This can be accomplished with a specially–rigged light, police siren light, Christmas lights or strobe light. Although there are commercially available versions out there, it’s far less expensive to build your own. With either some artistic talent or wood grain contact paper, even a cardboard box can be used to create a basic “Monster in a Box” prop. A battery-operated miniature police siren light or strobe light should suffice for light, assuming your design has openings that allows light to be seen. In a pinch, using chains made out of crumpled strips of aluminum foil can work if the prop is only shown in dim lighting and is kept far away enough from your guests. All you need for animation is a single Bumble Ball. That said, you should include some sort of partition (like a piece of wood) between the Bumble Ball and the part of the box where the lights and source of sound effects are kept. This also has the added benefit of helping weigh down the box enough so that it shakes without risking it moving around too far from its intended position. If you’re using a wooden box or chest, the use of multiple Bumble Balls is recommended. UPDATE: Apparently some brands of Bumble Ball-style toys are prone to overheating or breaking, so please do your research before purchasing any. Also be sure to never leave your “Monster In A Box” prop unattended for long periods of time as well! Special thanks to Terror Syndicate Productions for use of the image!